In June 1924, State College (now NC State University) established General Extension to offer correspondence courses and develop closer ties to industry and business. By the 1930s, its extension, correspondence, reading, and short courses served a student body representing every county in the state of NC, a majority of U.S. states, and several foreign countries. In 1965, College Extension was re-named the Division of Continuing Education. In 1971, the State legislature appropriated $4.25 million, to join the $100,000 in “butter and egg money” raised by home demonstration women, for construction of the McKimmon Center--named for Dr. Jane S. McKimmon, a proponent of continuing education and state director of the women's division of the Farmers Institutes from 1908-1911. Construction began in late 1973; was completed in 1976. In 1981, a 14,500 square foot addition was added. Today, MCE&CE is comprised of eight units that reflect the ever-growing demand for continuing education and the needs of the people it serves—the Center for Urban Affairs & Community Services, Customized Contractual Education, McKimmon Conference & Training Center, Office of Professional Development, Osher Lifelong Learning Institute, Technology Training Solutions, The Collaborative at the Gateway Technology Center, and the Upper Coastal Plain Learning Council. For a more detailed history of MCE&CE, click here. For an extensive history of continuing education at NC State University, click here. For instructions on how to enroll using the Student Portal, click on the link above or to download the instructions as a Word document, please click here. In a unique architecture course, NC State students helped improve environmental sustainability at the McKimmon Conference and Training Center. About 30 students and a major campus building are more equipped than ever for a sustainable future. That’s thanks to an NC State course called LEED Lab, which brings together future engineers, architects and environmental scientists for a hands-on experience as sustainability consultants. Using the Leadership in Energy and Environmental Design (LEED) rating system as a guide for sustainable best practices, the students in LEED Lab spent the Fall 2017 semester developing sustainability recommendations for NC State’s McKimmon Conference and Training Center. LEED Lab students were tasked with evaluating the building’s sustainability performance and identifying ways to decrease environmental impact and costs. Class sessions consisted of group work, environmental analysis and testing and even a waste audit. The students also engaged with campus facilities managers and representatives from the course’s corporate partners: SAS, Wells Fargo, JLL, Lenovo, Schneider Electric, Stanford White and FMI Corporation. Students learned to measure indoor air quality, analyze energy and water use, calculate payback periods on efficiency improvements and weigh tradeoffs. Save a bit of energy here, and it may increase costs elsewhere. Improve the environmental impacts in one area, and it may cause unintended consequences elsewhere. On the last day of class, students presented their sustainability recommendations, which ranged from harvesting rainwater and installing new lighting to calibrating air handlers to optimize energy savings. Two MCE&CE units--The Collaborative and Upper Coastal Plain Learning Council--received a two-page write-up in the Rocky Mount Telegram for their efforts to "boost eastern North Carolina's economic potential." The Collaborative was cited for bringing "valuable learning opportunities to a part of North Carolina once underserved by higher education." The Upper Coastal Plain Learning Council was recognized for "developing strategic solutions to engrained poverty in the region." "As of June 2017, The Collaborative has helped produce 194 graduates, many of whom might not otherwise have been able to pursue their degree." In addition, The Collaborative "...hosts numerous academic summer camps...Youth camps give K-12 students hands-on experience to subjects that can lead to promising careers." Among the UCPLC's programs is "Hometown Hires, which connects the long-term unemployed with job opportunities by providing education, training and one-on-one coaching." To read the full article that appeared in the July 31, 2017 Rocky Mount Telegram, click here. In April 2017, the McKimmon Conference and Training Center was certified by the NC State University Sustainability Office as a Sustainable Workplace at the Steward level. Sustainable Workplace Certification offers campus departments the opportunity to be more sustainable and earn recognition for these efforts. Campus entities earn points for adopting, or completing, sustainable practices in these categories: energy and water, transportation, purchasing, food and events, health and wellness, waste reduction and sustainability leadership. 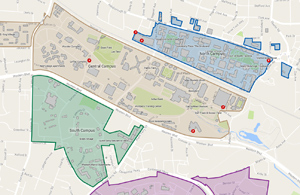 The goal of Wolfpack Certified Sustainable is to further sustainability at NC State by providing helpful information and encouragement for campus entities to institute sustainable practices in workplaces and campus-related events.